St. Rita Students (back row) shown here with students from Brisbane, Australia with their chaperone Mr. Tony Rolls and St. Rita teachers Mr. KC Perlberg and Mrs. Colleen Earley. 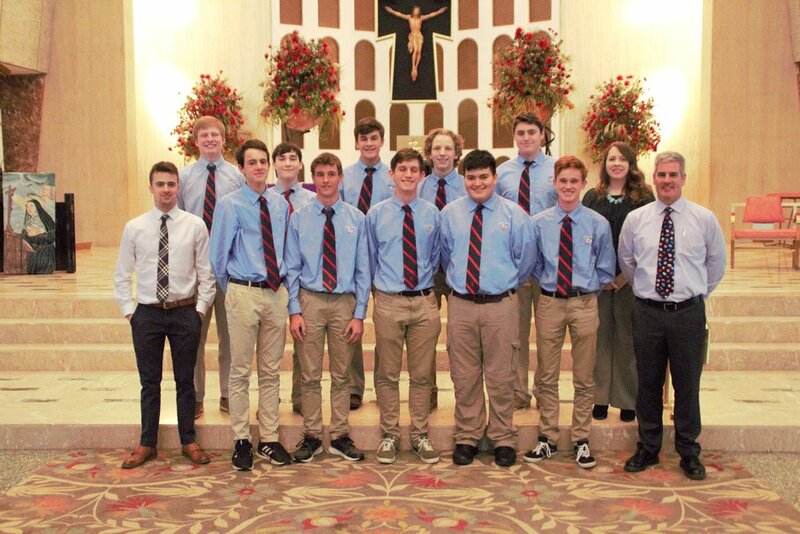 Saint Rita is in it's fourth year hosting students from Villanova College in Brisbane, Australia through a student exchange program. Villanova College is an all boys Augustinian school from grades 5-12. This is a unique program to Saint Rita. The Australians will stay for two weeks with Saint Rita host families and then the Saint Rita students will stay in Brisbane with host families for two weeks in May/June. The Director of the exchange program is Mrs. Colleen Earley. St. Rita students David Tolley, Jason Koch, Jack Majcen, Nick Rowling and Ryan Hixson are hosting Australians Elijah Abraham, Sean Kearns, Callum Moses, Sam Feenstra and Alex McDougall on many Chicago adventures. The Aussies also spent time in the halls and classrooms of St. Rita this week.